Diabetes carbohydrate counting for your type 2 diabetes care plan. 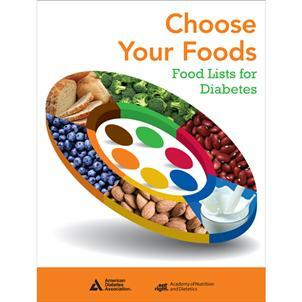 Manage blood glucose levels—choose wisely and set limits! No more "exchanging" - now you can Choose Your Foods! We took a great product and made it even better with a greater variety of foods. Carbohydrate counts for each food. Portion weights in ounces. And more. Lists are grouped into carbohydrate, fat, and protein and now allow patients to interchange foods from the starch, milk, and fruit lists. If you wish to order in quantities of 100 or more, please contact us for bulk pricing at 1-800-232-6455, Monday — Friday between 8am and 8pm Eastern. This is a great tool for anyone managing their carbohydrate consumption. Listing food by serving size helps you understand exactly how much to eat, and balance your diet.